Flowtron LE-900 :: Shred and Spread! 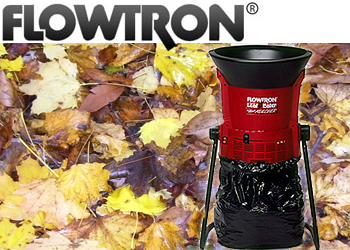 As fast as you can load it, Flowtron's patented Leaf-Eater Plus shreds wet or dry leaves, grass clippings - even pine needles - into nutrient-rich mulch or compost. Reduce the endless job of bagging leaves ... or eliminate it all together! Naturally nourishes your lawn and garden. reduce 11 Bags of Leaves to Only One Bag! Runs on ordinary household current. Lightweight and portable: weighs only 17 lbs. Unit size: 19.5" x 19.5" x 23"
If you have a question about a product, please take a moment and send us an email. Usually we respond to email the same day you send it to us.